Search screen can be opened by pressing button "Search" in the left menu. All data in Graphlytic are indexed and can be searched by fulltext search. User can search and view data which has permission to view. Only user with permission "Read all data" can search and view all data. What data are indexed can be configured (see Node index and Relationship index). Which columns are shown in search result and which columns are sorted can be configured (see Search tabs). New visualization - start new visualization for selected elements. See Visualization. Add to visualization button - add selected elements into current visualization. See Visualization. CSV export - exports result in CSV format (can be opened by Microsoft Excel). Exports only first 10000 records of result. See Export. Tabs can be used to filter some data. For example if your domain is Configuration Management then you can use tabs to organize data for example in these tabs: Services, Applications, Servers and Racks as in the picture above. If you enter string into search field then the fulltext search runs only within the data defined by currently selected tab. Configuration of tabs can be changed only by user with permission (see Search tabs). Search result contains all data that meet the combined search criteria defined by fulltext search field and filter defined by currently opened tab. 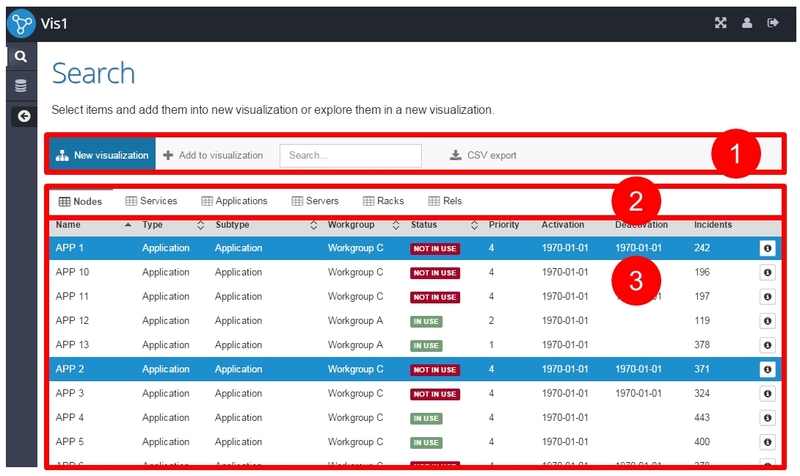 Selected records can be used to start new visualization, add to current visualization, export. Export options can be configured (see CSV export). Table contains only several attributes of element (node or relationship). To view all attributes press detail icon on the right side of record. Tabs of detail panel can be configured by (see Data schema). If there are too many columns in the result table some of them are automatically hidden (page is responsive). Press "+" icon on the left side of record to show hidden attributes. Sorting of column can be changed by pressing arrows next to the column title.